Tonight we feature two fine groups. Kátia Moraes and Brazilian Hearts plus Conganas. 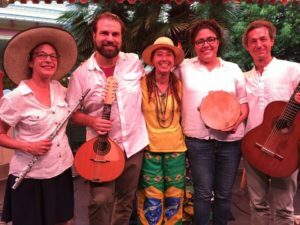 Hailing from Rio de Janeiro, Kátia Moraes and Brazilian Hearts bring choro and samba to Culver City this summer. Moraes’s singing, as praised by the Los Angeles Times, “is a virtual definition of the passion that is an implicit part of Brazilian music.”Featuring Nando Duarte, Ted Falcon, Fay Roberts and Clarice Cast. Moraes began performing in the 1980s, sharing the stage with the high-energy Brazilian band O Espirito da Coisa. Since then, she has worked with some of the foremost acts around the globe, including Sergio Mendes, Airto Moreira, Oscar Castro-Neves, Rita Lee, Elba Ramalho, Sandy and Junior, Banda Cheiro de Amor, George Duke, Alex Acuña and Justo Almario’s Tolú, Latin Project, and Praful. In 1990, she moved to LA, where she began working as a voiceover artist in film and television. She also continued singing with the likes of Pure Samba, Feijoada Completa, Samba Society, Bloco Nove, Falso Baiano, The Rio Thing, Midnight Drums, Sol & Mar, Folk Ballet of Brasil, Badauê, Man and Machine, and many more. She is currently singing with Brazilian Hearts—Choro & Samba, Samba Society, and Viver Brasil Dance Company. In 2011, Moraes created the annual musical entitled Brazilian Heart, a Celebration paying homage to inspiring Brazilian singer-songwriters. She has released numerous albums, including Ten Feet and the Sun with Brasil Nuts band, Ginga, Navegar ao Sol, Live, Tribo with Sambaguru, and two EPs. In 2018 she released Mistureba. Her work with the Pure Samba project was awarded the LA Treasure Award, granted in part by the California Traditional Music Society, a facility of the City of Los Angeles Cultural Affairs Department. In Culver City Kátia with be accompanied by Nando Duarte on 7-string guitar, Ted Falcon on mandolin and violin, Clarice Cast on percussion, and Fay Roberts on flute. Conganas which means “with passion” features some of the most talented and experienced players in the Los Angeles music scene today, not only do they perform with their own band but are also touring musicians with some of the greatest bands and musicians in the Latin Jazz, R & B, Pop and Soul genres. Conganas was formed in 2010 and is led by percussionist Christian Moraga originally from Chile. Conganas also features Cuban pianist Fermin Sifontes, American bassist Rene Camacho, and Venezuelan trumpeter Enzo Villaparedes. 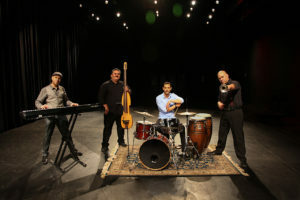 What started as a concept and challenge of replicating the sound of a full Latin orchestra playing a variety of salsa, cumbia, cha-cha, bolero, and Latin jazz, among many other Latin rhythms with only a quartet has led to many performance opportunities in diverse venues throughout Southern, California. The band has quickly created their unique Latin sound and spellbinding shows to other cultural frontiers. They are planning to release a new CD in in 2016. Each of the band members executes a vital instrument and also sings, making this complicated task and particular sound, a sought out band. Christian has assembled a wonderful cast of musicians, writers, teachers and historians and together they have put their stamp on their debut recording “Conganas”.